1. A banana training toothbrush and teether for those early growing pains. The affordable price point is also very a-peel-ing. 2. 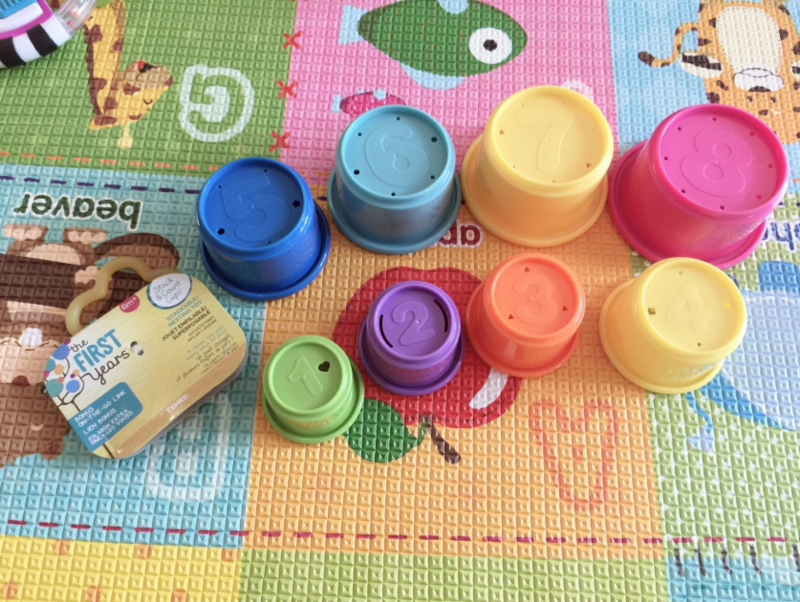 A set of your baby's first toy cups. They're colored, numbered, and will really stack up. 3. A set of three gel teethers you simply put in the fridge to cool and they'll help soothe your loved one's incoming teeth. 4. A bath toy octopus they'll love to play with — just toss rings onto the twirling legs. For this price, you've got to be squidding me?! 5. A travel-friendly musical toy made with seven classical tunes and a volume control button so it won't be too loud! Songs include: Mozart's "Eine Kliena Nacht", "Rondo Alla Turk", Vivaldi's "Spring" from The Seasons and Rossini's "William Tell Overture" and Chopin. 6. 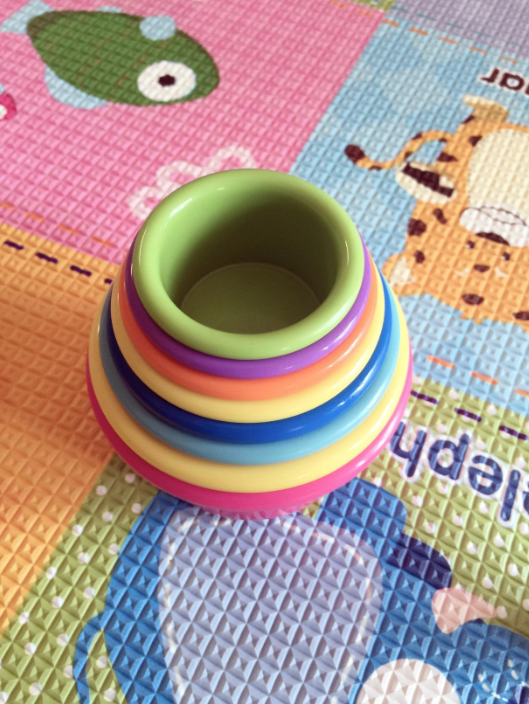 A lightweight rattle and teething toy designed to intrigue infants with its unique shape and colors. 7. A set of 80 jumbo-sized building blocks that'll let your little one's mind run free with creativity! 8. A set of two rattle maracas designed to be easily grabbed and played with. They have colorful beads in the base that make the rattle sound and soft pom-poms at the top! Promising review: "My newborn absolutely loves this toy. He grabs it and does not put it down. Great buy!" —Melisa M.
9. A set of floating bubble bath toys, each with a different toy inside! The ring around the bubble also moves to stimulate touch. 10. A fishing set for the bathtub! The kit includes one magnetic fishing rod and three underwater bobbing friends that have magnets on their heads for an easy catch. Nothing fishy here, just great fun! 11. A bendy ball that'll be easy to clean and fun to play with! Wow, genius. 12. A four-in-one kick and play toy where your baby can lay and play, sit and play, have tummy time, and you can fold it up and take it to go! Toys that come with the set is are a hippo teether, elephant clackers, rollerball frog & more! It also has music that can play long or short bursts of up to 15 minutes. 13. An educational bead maze toy for kids three months and older. It's designed with suction cups on the base so you can place it anywhere and keep it still. What an a-maze-ing feature. 14. A sit-n-spin your kid will surely fall in love with. I personally had one of these and it was one of my favorite toys! They sit on the blue base and spin the red sphere to twist their bodies round and round! 15. A Mozart magic cube that'll play eight different Mozart masterpieces at the touch of a button! Also this price point is music to our ears. The toy includes harp, French horn, piano, flute and violin instrument sounds! 16. A rattle toy designed to look like a little hedgehog! I'll hedge my bets, and say they'll want to hog this toy all day! 17. A set of 10 squeezable building blocks in unique colors and designs that include numbers, animals, and different textures! Promising review: "I just thought I should take the time to say something about these, because they are still a favorite in our house after two and a half YEARS. After much play from two children, these are still going strong and one of our household favorites. The colors are vibrant, the blocks are made of a thick and sturdy rubber, and the designs on them are so cute and very fun to look through." —Toni S.
18. A Wubbanub pacifier with a plush toy attached to help keep the pacifier in your baby's mouth and keep them entertained and feeling safe all at once! 19. A customizable wooden name puzzle for your kids to learn letters, colors, and of course their own names! Name a more iconic toy, I'll wait. 20. A stroller-attachable teether toy, because your little one will want something on the go to keep them entertained and feeling safe! 21. A portable stuffed owl buddy so your baby can have a sleep aid at night with a built-in calming sound machine. This product has 10 lullabies and is hand washable! You just pop out the sound system and you're ready to go! 22. An interactive elephant plush toy that'll have your kids bopping along to the songs and playing peek-a-boo with its ears!